The Security Council votes on a draft resolution on Syria. Amid the risks of the situation in Syria “spiraling out of control,” the United Nations chief has appealed to the five permanent members of the Security Council to break the current deadlock on reported use of chemical weapons in the war-torn country. “I have also been closely following developments in the Security Council and regret that the Council has so far been unable to reach agreement on this issue,” Secretary-General António Guterres said in a statement issued late Wednesday night. “Let us not forget that, ultimately, our efforts must be about ending the terrible suffering of the Syrian people,” he added. On Tuesday, the 15-member body voted on three separate draft resolutions in response to recent allegations of a chemical weapons attack in the Syrian town of Douma. None of the texts garnered enough support. The first draft considered today – penned by the United States – which would have established a new investigative mechanism for one year, as well as identify those responsible for the use of chemical weapons, was rejected owing to a negative vote – or veto – from Russia. Similarly, a competing draft – penned by Russia – which would have established the mechanism for one year as well but would have given the Security Council the responsibility to assign accountability for the use of chemical weapons in Syria, was also not adopted. The Council rejected a third text – also proposed by Russia – which concerned the work of the fact-finding mission of the Organization for the Prohibition of Chemical Weapons (OPCW), the implementing body of the Chemical Weapons Convention (CWC), which entered into force in 1997. Despite the deadlock in the Security Council, OPCW has said that it would shortly send a team to Syria to “establish the facts” surrounding the incident. On Wednesday, the UN World Health Organization (WHO) said that it has received reports that an estimated 500 patients at Syrian health facilities have exhibited signs and symptoms consistent with exposure to toxic chemicals, after the shelling of a Damascus suburb over the weekend. WHO has demanded immediate unhindered access to the area to provide care to those affected, to assess the health impacts, and to deliver a comprehensive public health response. 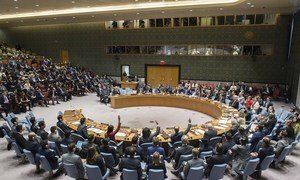 Days after an alleged chemical weapons attack in the Damascus suburb of Douma, the United Nations Security Council failed to adopt two competing resolutions that would have established a mechanism to investigate use of such weapons in Syria, as well as another concerning a fact-finding mission in the war-torn country.